I've never been very satisfied with the Hot Cross Buns I've made at home, so this year I decided to try something a bit different. 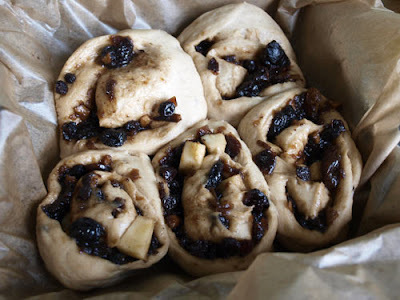 I like the idea of a rolled bun, like cinnamon buns, but with the flavours and filling that is reminiscent of a Hot Cross Bun. I made my dough in the bread maker, but if you don't have one you could follow any sweet dough recipe directions. Put the flour, yeast, cinnamon and brown sugar in the bread maker bowl. Add the melted butter, milk, yogurt and beaten egg. Set to 'dough' and go away and do something else. My bread machine takes 45 minutes to make a dough. Now you have an option, you can either watch the video below to see what to do or follow the instructions that come after the video. This is my first video clip, so please forgive the length and the fact that I do seem to pick things up with my hands - they are clean, honest! 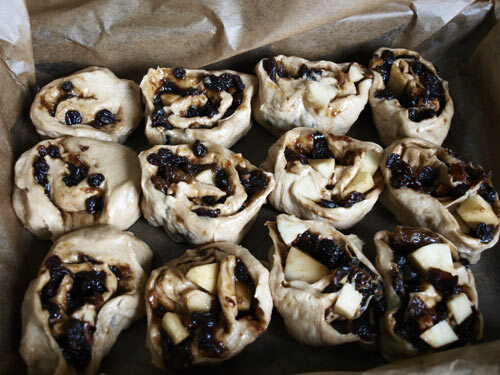 Flatten out the dough on an oiled surface (or it will stick) and then spread the mincemeat over the dough and distribute the apple pieces evenly across the mincemeat. Roll up the dough from the long side, tucking the join underneath. The slice across and put the the slices into a baking tin lined with baking parchment, cut side up. Put to one side in a warm place, to let the buns rise for about an hour and a half until they have doubled in size. Then bake at 200C/180C (fan) for about 30 minutes. To make the glaze, put the sugar, water and butter into a pan and heat slowly to melt the sugar, then bring to the boil and boil for about 3 minutes. Glaze the buns as soon as they come out of the oven. Leave them in the tin until just warm then remove and split. They are very, very sticky and absolutely delicious. It's a great first video(: lovely to see you in action! Fab video Janice! I was waiting for the Blue Peter ones you prepared earlier!! I'd be a lot more worried if you were picking things up with your teeth ;o) Fab first vid and the buns look delicious - I've just ben transported back to my student days when we used to wait for the Chelsea buns to come out of the ovens in the Union cafe at about 11:00 o'clock! They look utterly delicious. 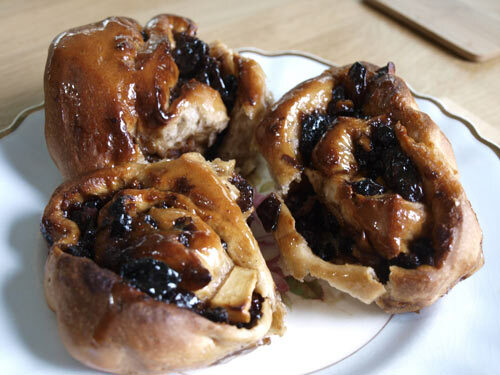 I love the idea of the fresh apple and the sticky, spicy mincemeat together. Yum! I went to Stockholm recently, where they live off Cinnamon Buns! I love this version! these look amazing Janice, JUST so sticky and well, EDIBLE! LOL! I love these, makes a nice change from Hot Cross Buns! I love the combination of cinnamon buns and hot cross buns. They look lovely and sticky. Fantastic, and I have a jar or two of mincemeat at home so will be trying to make these very soon. Those buns look tasty Janice and your video was not too long and very informative with a touch of humour. Janice. Amazing video!!! I love your voice and the gloopy sucky sound of the mincemeat!! Genius. Lovely buns and I'm off to make my first video this weekend !! Oh wow! I wish I had seen this post earlier and could have made some for our Easter weekend too. They look amazing! These look seriously sticky and so inviting. Buns are for life, of course, and not just for Easter. I thoroughly approve of the use of the breadmaker - I'd be lost without mine.